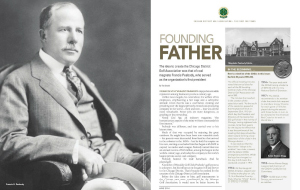 More than 100 years ago, Hinsdale Golf Club president Francis Stuyvesant Peabody first gathered representatives from 25 clubs in the area to discuss the idea of forming an association to discuss issues facing the golf industry at the time. The first planning meeting took place on Sept. 25, 1913, and featured representatives from Beverly, Calumet, Chicago Golf, Edgewater, Evanston, Exmoor, Glen Oak, Glen View, Homewood, Idlewild, Lake Shore, LaGrange, Old Elm, Onwentsia, Park Ridge, Ravisloe, Skokie, Westward Ho, Westmoreland, Wheaton, Windsor and Winnetka. 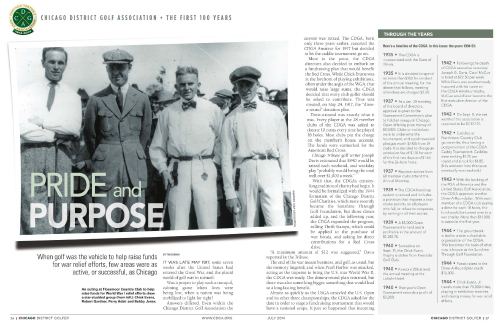 The idea to form an association was met with unanimous support, and the Chicago District Golf Association was officially formed on March 18, 1914 at the Chicago Athletic Club. For the ensuing century, the CDGA has carried out Peabody's original vision of assisting clubs in growing the game of golf, while providing beneficial services to individual golfers in the area. Even before the creation of the CDGA in 1914, the game of golf had a strong presence in the Chicagoland area. 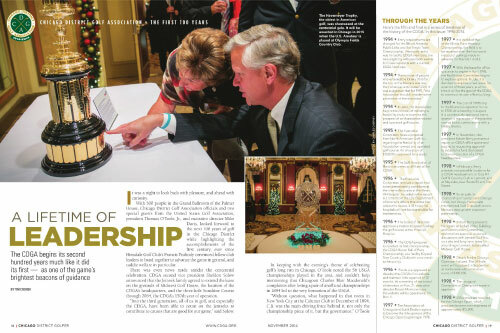 In its first 20 years, the CDGA made significant strides in growing membership, developing rules and procedures for golf in the District and raising money through its charitable arm. During and after World War II, the CDGA utilized golf to contribute to war efforts and recovery. 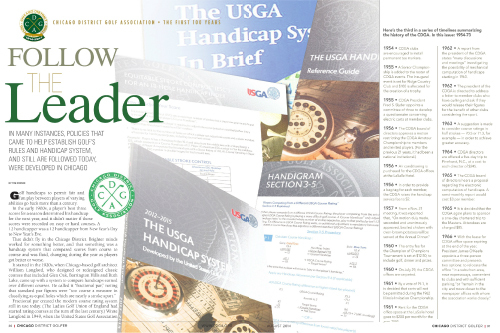 The USGA Handicap Index® underwent many changes before becoming what is today, a process that the CDGA played a large role in. Carol McCue (1942-1977), Denny Davenport (1977-1996) and Robert Markionni (1996-Present) are the only three Executive Directors in CDGA history. McCue and Davenport helped grow membership significantly in the late 70s, 80s, and early 90s. 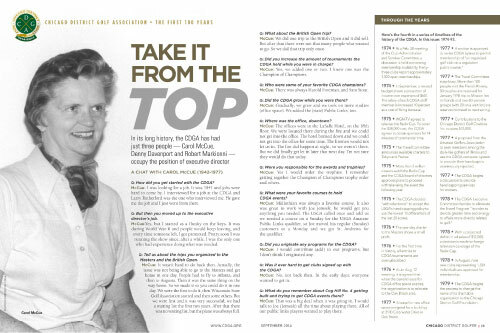 The end of the CDGA's first century served as a time to reflect on how the Association impacted the growth of the game, as well as how it will continue to do so in the future.